PudnerSports.com: Midwest Region Click for Results: Horizon Only Surprise among Big 10, Mid-American and CUSA. 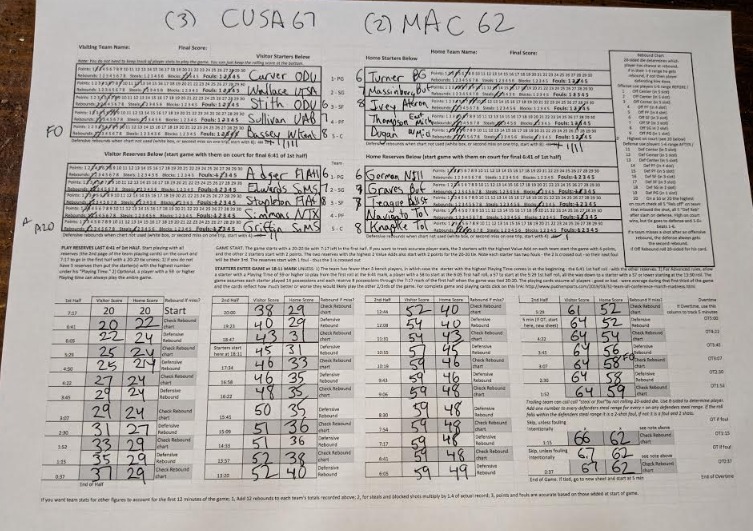 Midwest Region Click for Results: Horizon Only Surprise among Big 10, Mid-American and CUSA. 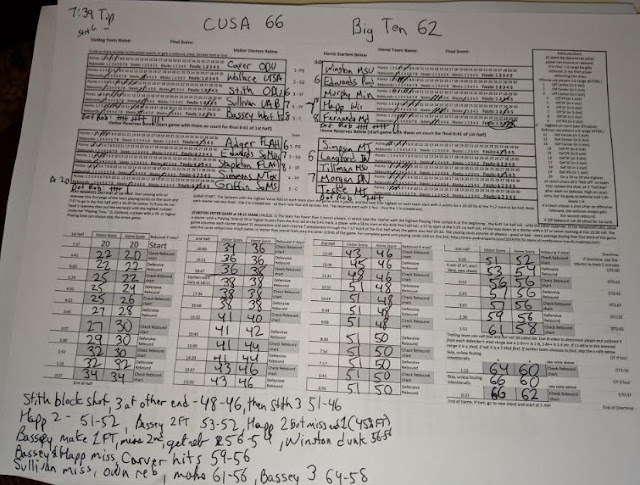 Scroll down for results and score sheets for the Sweet 16 and Elite 8 games in the Midwest. To see the Final 4 results click here and scroll to the bottom for how to play your own games for free. 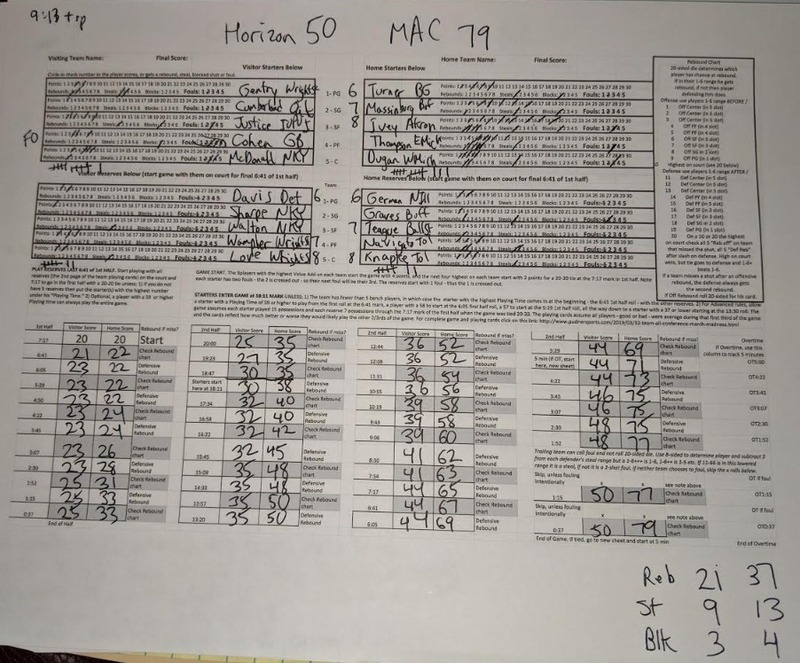 The 2-seeded Mid-American Conference (MAC) looked like a serious challenge to the 1-seed Big Ten, but a bad luck of the draw made them sweat out a 4-point win over the Ohio Valley Conference. The seeds are based on the conference ratings at www.kenpom.com, but the OVC was a huge threat with the second best NBA prospect in the country Ja Morant. The MAC survived that tough draw and then took it out on the Horizon (see below), but the big surprise came when the Big Ten was the first 1-seed to fall in a thrilling back-and-forth that ended in CUSA advancing to play the MAC for the Midwest Title and a Final Four appearance. The one vulnerability of the great Ethan Happ (Big Ten, Wisconsin) did hurt down the stretch, as the 45% free throw shooter missed including one roll of "10" on the 20-sided dice which is a made free throw for anyone player who shot 50% or better from the line. 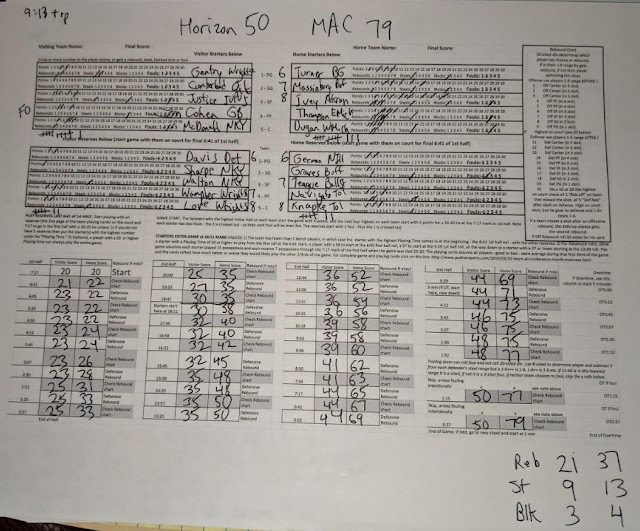 Stopping Ja Morant was tough in the 1st round game, but the MAC led by Buffalo stars found the Horizon League no challenge. After announcing his bout with cancer, UVA legend Jeff Jones watched his old team team take the national title after coaching BJ Stith, the son of UVa's all-time leading scorer, and Old Dominion to a CUSA title and scrappy appearance against powerhouse Purdue. Purdue then almost knocked off UVa. 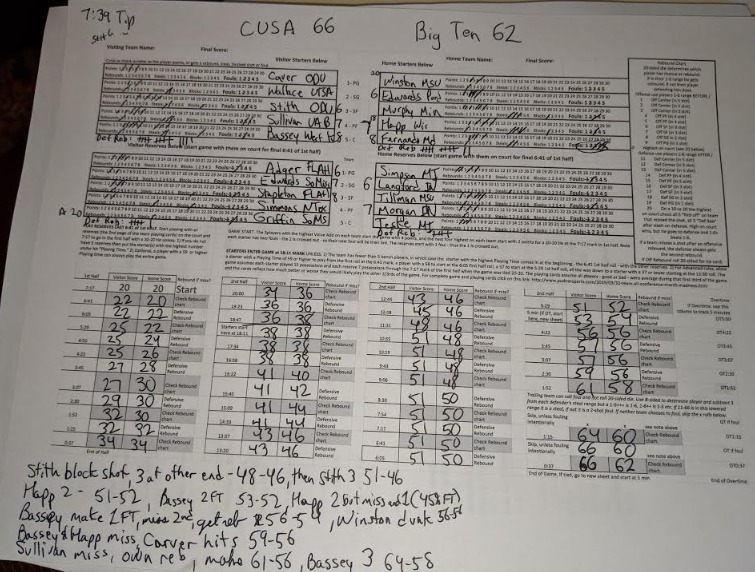 In the game, ODU's CUSA went through the entire Midwest Region without beating anyone by more than 10 points - including narrow upsets of the 1-seed Big Ten and then 2-seed Mid-American (MAC) led by Buffalo in the game below. The Region championship in the game pitted them against the MAC, two teams that narrowly missed winning the actual live 3-on-3 all-conference championship - both losing to the eventual champion CAA by two points.. Repeating that real 3-on-3 title in the simulated full 5-on-5 March Madness we are playing out could prove even tougher. While the CAA won their first three games by an average of six points, their semifinal opponent is the ACC, which averaged winning their first three games by 21 points each. Here is the scoresheet on their Midwest championship win over the MAC which put them in the Final Four.